The more of a presence you can generate outside your main professional hub, the better chance you have of building a unique fanbase for your work. A well-connected, market-focused, and specific online personality is definitely going to make readers sit up and take notice, no matter the content. But this investment in your community takes time and money. You really have to be an educator about your book’s availability/release date and toot-your-own-horn on other community pages in order to get coverage. For example, you can use notable, in-the-news-now events to generate buzz for your topic. Or, if you need Twitter or Facebook help, ask your contacts, as you may know someone who can build and manage your community. An Author Page. Beef up your bio and list other published books. Add your social media accounts and promote upcoming events. A BookBuy Page. This sales page allows readers to purchase any book format you’ve published and displays the Book Cover, Marketing Metadata, and a Preview of the Book. 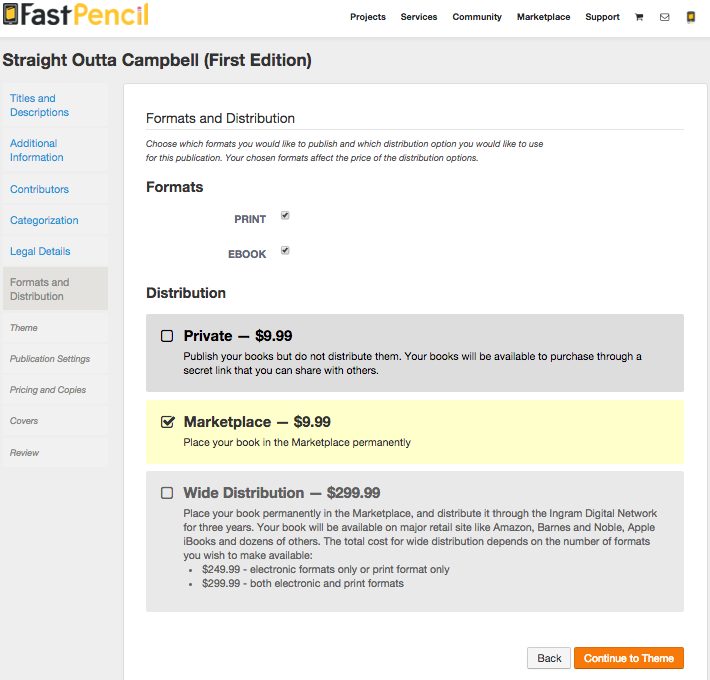 FastPencil Marketplace Only – $9.99. Global (Wide) Distribution – $249 (ISBN for e-book only) or $299 (for 2 ISBNs for both print and e-book bundles) with Global Distribution. *Tip – What’s in an eBook Bundle? Mobi – Amazon exclusive file, created for the Kindle. PDF – Computer device industry standard. Metadata – Marketing tidbits paired with your publication formats. Publishing wizard guides authors through the metadata collection process prior to publishing. This information is paired with ISBN, Covers and book files and distributed to all sales channels once the title is published. TIP – To upload a MS Word Document file and organize it into chapters and sections, label all your Chapters and Sections as “HEADING 1”. Once you import this document with the “heading 1” label, the publishing platform will separate all the chapters and sections for you. Alternatively, copy/paste each chapter and section, to ensure your styling and content is imported, section by section, paragraph by paragraph. Print-on-demand technology + a global distribution network of sales channels, FastPencil is changing how people around the world buy and sell books and eBooks.